After you pass the Niomon gate, it is a walk up 99 steps to the water basin, purifying hands and mouth and mind. Then another 230 stone steps (maybe one or two more) to the main hall. there lived a young girl at the bottom of this mountain, who was weaving material to make a living. One day, a poor priest came along and asked her for a piece of cloth. Without further ado, she cut the cloth she was working on in half and gave a piece to the priest. The father of the girl had been sent off to a far-away island, although he was not guilty of any crime. The mother, who was pregnant when this happened, came here to give birth to the daughter but died without being able to fulfill her wish of praying properly to the Holy Kannon. So the priest carved a statue of the Holy Kannon with a piece of cloth over her arm and gave it to the girl to pray to every day. The girl than transformed herself, sending out 7 layers of light and became the Holy Kannon herself. As you guess, the priest was no other than Kobo Daishi himself. 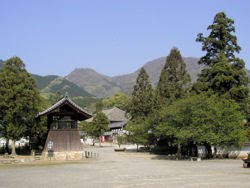 According to legend, Kobo Daishi founded the temple in honour of a beautiful young girl. Every day, while he performed his meditations in a mountainside hut, she interrupted her cloth-weaving -- kirihata means "cut-cloth" -- to bring him food. Eventually, she told him her story: Her mother had been a lady of the court in Kyoto and her father an officer in the court guard. Before she was born, her father had been exiled for his part in a rebellion and her mother, fearful of the danger to her unborn child, prayed to Kannon, the Buddha of compassion. Her prayers were answered and she managed to flee to Shikoku where she raised her child until she died, leaving the daughter alone. 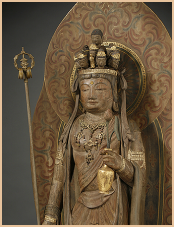 Kobo Daishi was so moved that he carved her a statue of Kannon and, heeding the girl's wishes, ordained her as a nun. 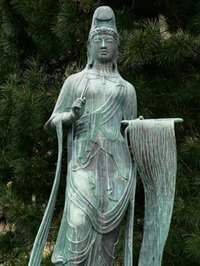 She immediately attained enlightenment, or Buddhahood, and changed into a statue of Kannon joining the one Kobo Daishi had carved. Kobo Daishi took the two statues and enshrined them in the temple he built in the girl's honour. Kirihataji is understandably popular with Japanese women. Before Kobo Daishi, women were thought incapable of Buddhahood. Women had to be re-born as men to have that potential. Kobo Daishi's teaching of Sokushin-jobutsu -- that every person has a Buddha-nature and is capable of attaining enlightenment "in this very body, in this very life" -- changed that attitude. Arguably, it is these influences that have made Kobo Daishi "the most prominent and influential individual figure in popular Japanese religious history," as Ian Reader writes in Religion in Contemporary Japan. In 828, for example, he founded the first school for commoners, providing food, shelter and education. This was unheard of at the time: Only aristocrats could obtain an education. This statue is also part of a set of stamps from the 88 temples of Shikoku. Temple Taimadera 当麻寺 / 當麻寺. . This mandala was woven around 763. 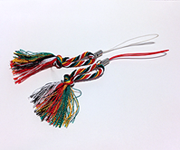 The fibers for the original version are said to have been made of lotus fibers, prepared carefully wiht the help of two nuns. Later it was said these two were Buddha Amida and Bodhisattva Kannon themselves. Once upon a time, in Nara, one beautiful princess named Hase lived. ... her mother in law detested Princess Chûjô (Hase). She began to raise a hate more than more. Her flames of hate toward Chûjô-Hime burned into flames. "Gather a lot of threads of lotus as much as possible and load them on the back of hundred camels." Princess Chûjô gathered a lot of stems of lotus with her father's aid. Another evening, two nuns visited her again. They began to spin the stems into threads. The two nuns brought out these threads by the fountain in front of the temple and rinsed the thread of lotus in the fountain. 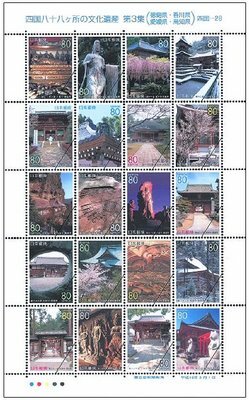 is a famous temple in Nara, originally build in 612 by the Imperial Prince Maroko, a brother of Prince Shotoku Taishi. It has a famous grove of red maple trees in autumn. The main object of veneration is the Budda of Medicine, Yakushi Nyorai, but the most popular attraction is the Taima Mandala, a graphical representation of the Pure Land of Buddhism, according to the sutra of the contemplation of Amitayus 観無量寿経. A special amulet is sold to ask for her guidance. Visiting temple Taimadera on Mount Futagami, we saw a pine in the temple yard that was really old, maybe a thousand years, "big enough to hide an oxen". It was not a sentient being, but it had been saved from the woodcutters ax.
. Nozarashi Kikoo 野ざらし紀行 Nozarashi Kiko . mandara e 曼荼羅会 "Mandala meeting"